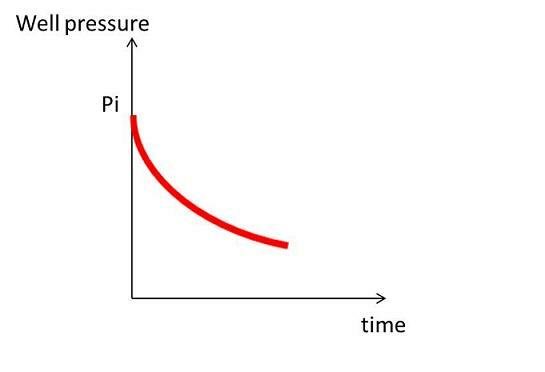 The Deconvolution technique transforms variable rate and pressure data into a constant-rate initial drawdown pressure response with duration equal to the duration of the entire test. Plotting this response and its derivative with respect to the log of Δt versus the test duration Δt on a log-log scale gives the deconvolved response, as shown in red in the figure below. 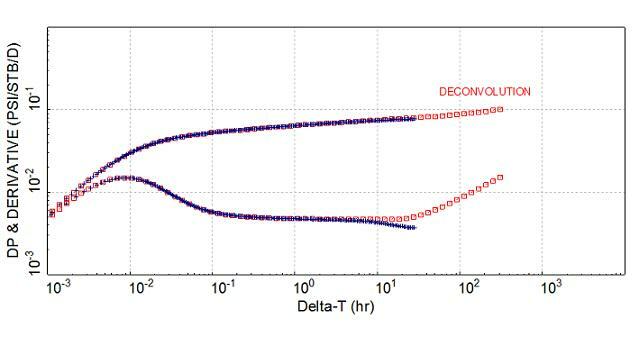 The duration of the deconvolved derivative plot is equal to the entire test sequence, from production start-up to the time when the PBU test is performed. The response is free from any distortions (errors) that are caused by the conventional derivative calculation algorithm. As a result, it provides a better identification of the different flow regimes over time. The deconvolved derivative is defined over a longer time interval than the original PBU duration. It therefore provides additional reservoir insights and may help to support radial flow regime in the horizontal plane, as well as the presence of boundaries. It also provides technical evidence for increasing minimum connected volume. Deconvolution helps to refine initial pressure and on some occasions can also help to shorten the PBU test (we need to be cautious when shortening a test, in particular as production time increases). Deconvolution can be applied to brand new wells to improve the understanding of the pressure transient response. But pressure data from more mature wells can also be re-assessed with deconvolution so as to provide new clues and to challenge previous interpretation. It is worth noticing that deconvolution has some limitations and may not be correctly derived. For deconvolution to be valid, a number of conditions needs to be reached, such as single phase flow in the reservoir or sufficient PBU test duration. Before using deconvolution as part of the well test analysis toolkit, it is therefore critical to confirm its validity, and this needs a bit of expertise. More on deconvolution and know-how in the library in the learning centre. To access the library, you need to join the Well Testing Group. Already a member, send me to the library ! Previous Post: What is Well Testing ?